A cloudy morning in Palm Beach. Can you see the airplane coming in for a landing over the Breakers Hotel? The weather here has been very un-Florida-like for December. Rain clouds in the distance… Please don’t come this way! It rained non-stop for the last five days. I know by looking at these photos you think I’m exaggerating but it’s been unbearably gloomy lately. What happened to cool, breezy, and sunny December? How do you northerners live without seeing the sun for weeks at a time? I swear, it’s been five days and I already need a vacation to a tropical paradise. If you read my previous post, you know that the local country radio station, WIRK, planned an outdoor concert for Friday at Harbourside in Jupiter. However, when Friday morning rolled around, it was very clear that there would be NO outdoor concert that evening. The day began and ended with torrential downpours. My signature cocktail – Jameson and Ginger served with a lime. Lafayette’s specializes in Southern and Cajun cuisine. 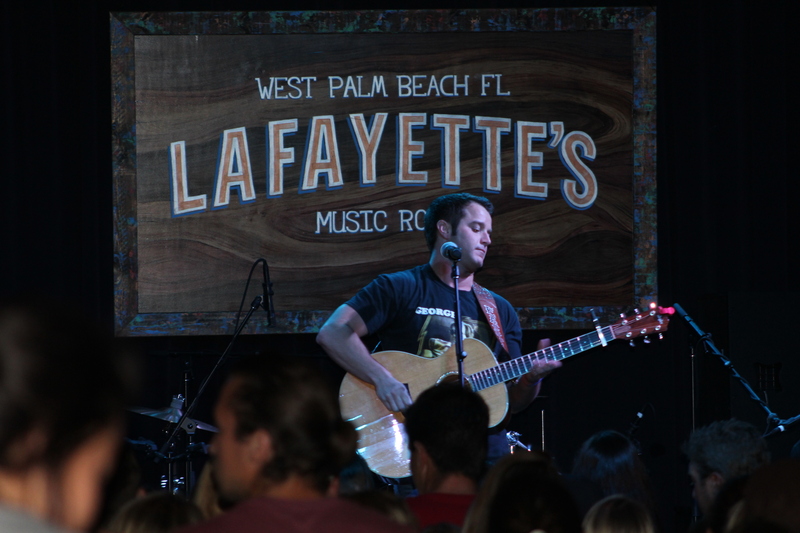 So, in good ol’ country fashion, the concert was moved indoors to Lafayette’s, a new bar, restaurant, and live music venue in CityPlace, West Palm Beach. Because of the location change, the concert was limited to the first 500 people in the door. I sent P there early on a mission to get us a table with a view – he succeeded and from our perch overlooking the dance floor I took some decent photos of the opening act, Logan Mize, and the main attraction, Easton Corbin. I’m still getting the hang of this “real camera” thing. Logan Mize entertains the crowd at Lafayette’s in CityPlace. P and I enjoyed Logan’s performance despite only knowing a few of his songs. He talked with the audience about growing up in a small town outside of Wichita, Kansas, and how it influenced his music. Logan even chose one very lucky audience member, Aiden, to help him start out his newest song, Can’t Get Away From a Good Time. Aiden got to hold the harmonica for Logan during the opening riff. Next up was Florida boy Easton Corbin, who I’ve admired since his first hit, A Little More Country Than That, way back in 2009. It’s always nice to know another Florida native. Easton played all of his hits, including Roll With It, Lovin’ You is Fun, and Clockwork. P, being the generous Southern gentlemen that he is, saw another couple sitting uncomfortably at the bar. Because we had a large booth all to ourselves, P invited our new friends (we’ll call them K & D) to join us. They love country music and concerts as much as we do, so I see a great friendship in our future. K pointed out that Easton uses the same guitar for every performance. All the wear and tear from strumming produces a big hole in the front of the instrument. Easton’s much loved (and played) holey guitar. There was even an onstage proposal during one of the songs. You show off that ring, girl! We can’t wait for the next WIRK free concert. Fingers crossed for better weather!